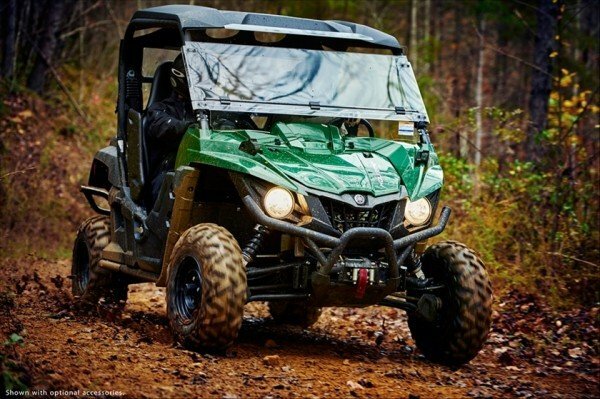 The side-by-side UTV market is one of the fastest growing segments in the motorsports industry. Today’s UTVs are almost the size of a small car with the suspension of a rally car. And they keep getting better and better. The new Yamaha Wolverine R-Spec is a hunter’s dream, representing the ultimate craft for expeditions and chasing game across wide expanses. Improvements this year include bigger tires, better suspension and a slightly smaller cargo bed. It’s 708 cc motor is capable of reaching speeds of 50 mph. At Yamaha Motors, product designers have been listening to their customers. We caught up with Steve Nessl of Yamaha Motor Corp at this year’s SHOT Show in Las Vegas, Jan 19-22. “What we’ve learned is that people want to take more things and more people with them, and they need the vehicle that’s capable of doing that,” Nessl said. The Wolverine also comes with a winch off the front and a removable windshield for protection from the elements, but you can add a whole slue of after-market accessories. With power steering the Wolverine starts at $13,000.